Tomato concentrate or purée, delicious used in pasta sauce to enrich it and a spoonful in soups and stews adds a little something special. I know it´s not very expensive to buy, but if you are dealing with a glut of tomatoes and have time on your hands, why not give this a go? I have to say from the outset, you do need to set aside about 6 hours to make just a few jars. It´s not tricky, but you need to be around to watch the pot slowly simmering away all the water from the tomatoes and leaving you with a gorgeous, thick, sweet and intense paste. Start by either peeling, deseeding and blending your tomatoes, or (as I do), roughly chopping and then simmering whole tomatoes for about an hour before passing them through the vegetable mouli. Incidentally, this is another method for making preserved tomatoes. After you have “mouli-ed” them, you can put them into sterilised jars and tuck them away for a rainy day if you don´t want to go on and make concentrate. Using the second method you may have a few stray tomato seeds in your purée, but hey, it´s homeamde! Next you need to add about a teaspoon of salt to approx 4 kilos of tomatoes (this gave me three small-ish jars of concentrate) and put them into a wide, heavy based saucepan. You can use a narrower pot, but it seems to take longer as I find the water evaporates more quickly from a wide pot. Now keep them at a gentle simmer, you will need to keep them cooking for about 5 hours. Slowly, slowly, the magic will happen. Every so often you need to give them a stir with a wooden spoon to make sure they don´t catch on the bottom. Finally, your patience will be rewarded, and just when you thought you might as well give up and turn it into pasta sauce, you have a pot of sweetly fragrant tomato concentrate. Now you can put the hot purée into hot sterilised jars and seal. No need for a hot bath for the jars afterwards, unless it makes you feel “safer”. I also add a thin film of olive oil, so that when I do break open the jar and start to use it, the concentrate or purée underneath will not dry out. Delicious, rich…what other words haven´t I used? Oh yes, you´ll also feel supremely smug when you tell people you have made it yourself! Definitely well worth the effort! It´s actually quite exciting making it and watching it change – or am I just a very sad person?! Oh yum, looks worth the effort. I really need to do something like this when our tomatoes have ripened. Yum. Even if you just do one batch, I can recommend doing it just for the sense of satisfaction it gives you! It looks wonderful! We do this a lot, preserving enough tomatoes to last us through the winter (and we eat a lot of tomato sauce, etc.). I find roasting them in the oven first speeds up the process (early in the morning when I can bear to have the oven on), then putting them through the mouli, then simmering to the required concentration. As well as the smugness, the rows of jars make such a good sight on the shelves too! Now I know who you are! I do also make conserva your way after I saw your suggestion a while back – roasting them, then the mouli but not reducing them quite to puree….really intense flavour. I now have a whole variety of jars on the shelves (and they do look pretty)…they will probably all be slightly different! Sorry, the comment from ‘Elinor’ was actually from me….didn’t realise my daughter had logged in on my computer until I’d posted it! When I first saw it I thought…this method sounds like the one Chaiselongue uses! It´s funny, as I was writing the post I found myself wondering the same thing! Would the water be able to evaporate enough? I know who to ask, but she’s on vacation right now…Will do some research. (can’t say much – got Kenalog in Orabase Kenacomb stuff in my mouth – talk about horribly bad [wisdom tooth] teething!) ouch. What a great idea! I can only imagine how great your concentrate must taste and how wonderful your sense of accomplishment, having babysat those tomatoes from weeks-old seedling to jarred paste — even longer it you started your plants from seed. We started with seedlings, but right from the start I was planning all the things I wanted to do! We´ve just planted a second batch, hope it´s not too hot for them. Am feeling like a proud parent today! That looks beautiful, I hope to get to the point where I have enough tomatoes to do this. Otherwise a few kilos of squishy tomatoes from the farmers market if they sell them off cheap would be perfect for this! I do something similar, but I use the slow cooker on a liw setting overnight to cook the tomatoes, then I transfer them to the stove. That´s good to know as I just had a question about using the slow cooker! That is a good idea, but won’t work for us. We live on top of a mountain in Andalucia, and are totally off grid. We generate our own electricity, hence a slow cooker might use up too much power for us! That looks fantastic. It reminds me of staying in Normandy with some friends’ parents. They had the entire basement of their house as a second kitchen, solely for preserving tomatoes, peppers, anchovies etc. They even made their own home made cider and calvados. I was dismayed to discover that most people of 40 or younger no longer bothered and went to the supermarket instead. So glad I found your blog, and thanks for commenting on my blog! I live in Andalucia too, and made puree Monday, and yet more today! Then comes: canning tomatoes, making ketchup, making salsa, making curry sauce,the list goes on!! 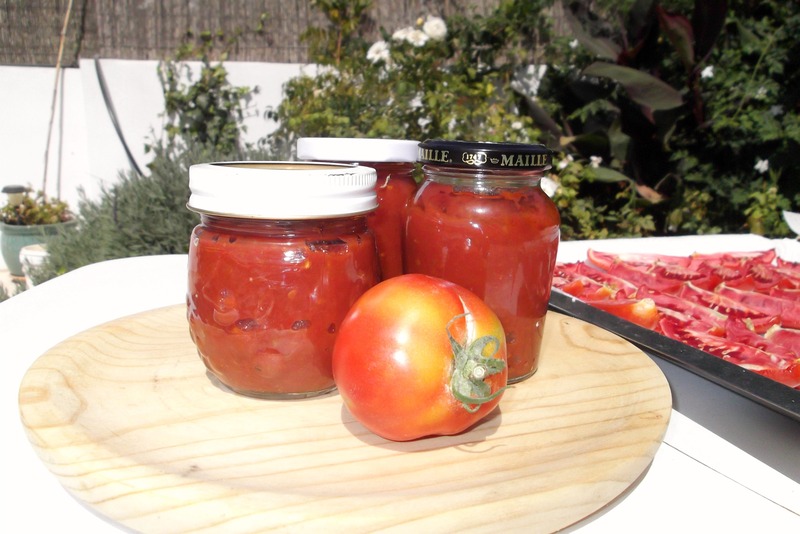 I guess the kitchens of Andalucia are busy this month doing exciting things with tomatoes! I really admire your devotion of growing those wonderful tomatoes and making a concentrate out of them, not to mention those 5 long hours of slow cooking! Wow! I am so sure the end result is a delicious, great tasting, hearty tomato concentrate! It is very, very good although I do have moments of wondering “am I bonkers to do this when I could just buy it”, then I taste it and remember why I do it! Smug was exactly what I was thinking as I read this and pondered making it myself! I bet your kitchen must have smelled awesome! Sometimes I do make things by scratch regardless if it could be purchased for less; it’s made with love and that “smugness” just makes me smile! You’ll be making some great meals with this! The kitchen did smell amazing and it was a kind of nice smugness…not too haughty!! I think you have every right to be smug… I can *almost* smell it! Mmmm…!! It did smell wonderful, I have to say! Good idea…and a doouble whammy in the kitchen too! Heavenly indeed – can´t get the smell out of my nose! Thank you so much for your kinds words and also for subscribing. Do hope you continue to enjoy what you read! They were very good, and we now have a second planting. Big Man is very good at keeping them well looked after and I just water, pick and cook. Oh I’d feel smug too! We’re on the waiting list for an allotment and I can’t wait until we can grow our own vegetables. You can never have too many tomatoes! I agree re the tomatoes…and in the UK you can grow things like peas which we can´t grow here…ooh and parsnips!